A single cell is seeded per well and the formation of a tumor sphere is monitored over the next 15 days using the Celigo and the tumor sphere application. Celigo captures whole-well images on day 0 to document the presence of 1 cell per well. This data is used to verify that the formation of the sphere originated from a single cell. 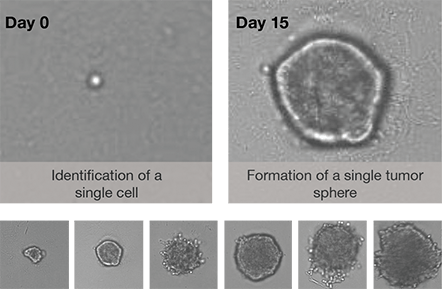 On day 15 the entire 96-well plate is imaged and the tumor sphere size is automatically analyzed. The size distribution graph on the right shows a variation of tumor sphere sizes, (100 – 300 microns) that arose from single cell clones seeded on day one. The Celigo-captured images (below) show the great variation in formed tumor sphere size and morphology.